Mystery abounds in the Black Beetle’s hometown of Colt City! The mysterious masked avenger known as the Black Beetle is on the case! Who is he? Where did he come from? We’ll have to stay tuned and follow his adventures to find out this mystery and more! 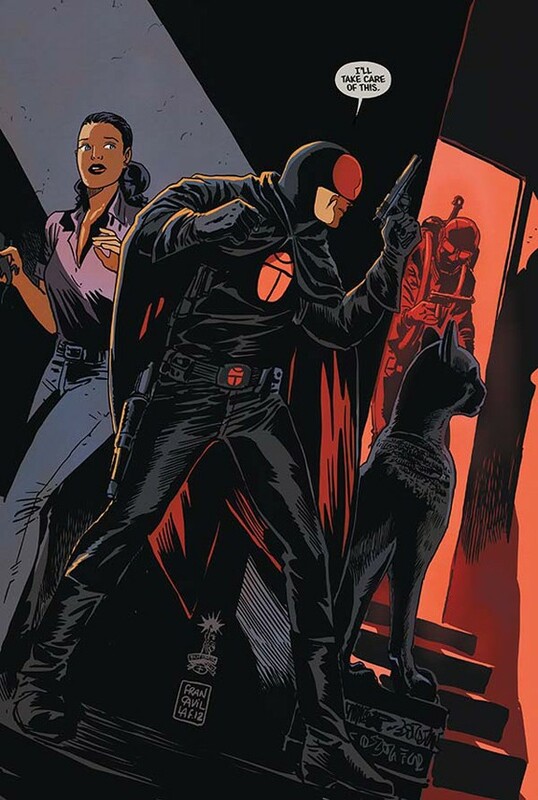 Francesco Francavilla, known for his breathtaking art on such modern classics as “Batman: The Black Mirror”, released the first of his planned miniseries “No Way Out” featuring his creation the Black Beetle in 2013. Also included in this gorgeous collection is “The Black Beetle #0: Night Shift” from 2012, which acts as a prequel to the first miniseries and most definitely to the follow-up for 2014. Both the zero issue and the four issue miniseries introduce the reader to a familiar, yet highly original character who resides in the fictional Colt City in 1941 where mafia families reign, Hitler is headline news, and dames sing in smokey nightclubs. Francavilla brings his unique style to a story borne from a place and time that obviously ignites his imagination. Through his love and excitement, the reader is lucky to see that place and time filtered through a story filled to the brim with intrigue, excitement, mystery, and downright fun. 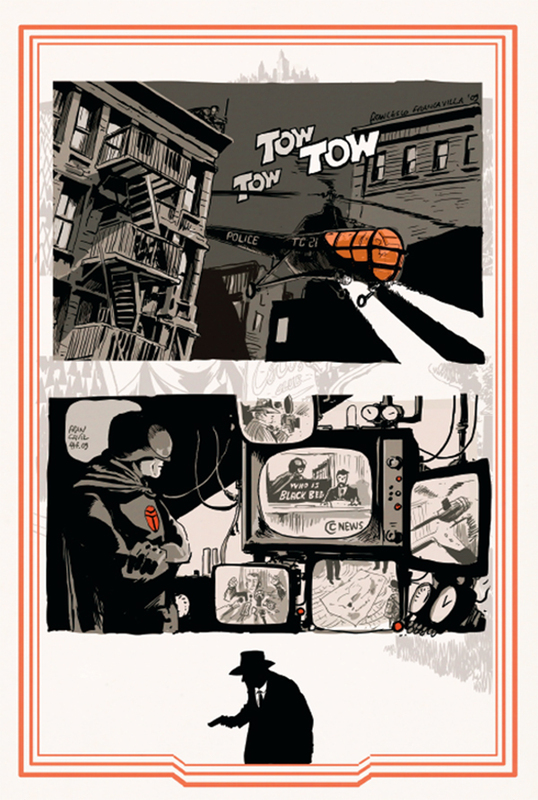 Francavilla was clearly influenced by hardboiled fiction and radio serials from the 1940s. This can be heard in his word usage throughout the book. His use of language is frank and fun, telling the audience only what it needs to know and holding back to keep us on our toes. Using cryptic phrases such as “kara böcek” lends mystery to the proceedings. He also sprinkles humorous asides throughout the book, with the Black Beetle thinking to himself, “I’ll never understand why they always run” as hoodlums flee the scene. In a humorous exchange with Dr. Antonia Howard, she playfully calls him “Mr. Scarab”. He shoots right back by saying, “It’s Black Beetle”. Heroic language is also spread nicely in the story, as when, in one of many (gorgeous) splash pages that inhabit the book, Black Beetle confidently declares, “I’ll take care of this”. And the audience believes him. Mystery appropriately permeates this story. The only time a human name is given to the Black Beetle is when he’s undercover in a nightclub and wearing a fleshy mask to conceal his true identity. Obviously, one must not trust the name given freely by this man. He makes frequent mention of his “H.Q.”, yet that headquarters is never shown to the reader in any detail. He also, during a balletic fight scene that must be seen to be thrilled by, mentions in voiceover that he learned “martial arts moves” in the “orient”. What happened in this man’s past? Where did he come from and why is he the Black Beetle? Francavilla wisely keeps the motivations and personal life of the hero under wraps (for now), keeping to the pulpy atmosphere of the story. Francavilla hews to tropes and it works splendidly. By leaving readers wanting more information, it keeps his audience, including this reviewer, enraptured. A gorgeous page from the extras in the back of the book! Besides mysteries galore, another trope used very much in Francavilla’s favor is the abundance of action packed into his tale. In the extras section in the back of the book, Francavilla describes how he hired a martial arts expert to help “choreograph” a six page fight scene in the third issue. This dedication to his craft only enhanced this one-sided fight, which is glorious in its cinematic quality. This scene is proof that Francavilla is a master artist and storyteller. The tension he builds before the battle commences is palpable. Before the inevitable throwdown, fists are shown, faces are in shadow, and the whites of a hoodlum’s eyes contrast beautifully with what looks like the white of the slightest of grins on the man who calls himself the Black Beetle. Color is breathtakingly used here (and throughout the series), with orange, yellow, black, and blue being the primary colors used to convey motion and a sense of thrilling action. In one particular panel during this epic fight, the color yellow illuminates two goons colliding because of the hero’s efforts. The pièce de résistance of this panel is the big, orange “WHACK!” that arouses feelings of pain that Black Beetle’s foes must be feeling at that moment of impact. Dark, moody atmosphere drips from Francavilla’s pages. He employs dynamic page layouts, color, and shadow to build scenes that thrive on the old pulp stylings that he adores. Everything is “big” and epic, even when the actions and locations are something as “everyday” as “flying”, driving, or deducing a mystery that only the Black Beetle could figure out with his keen mind. When the Black Beetle is “flying” to “the Fort” (which is, as he tells the reader, the prison “Alcatraz was modeled on”), the perspective of the two-page splash puts the reader in his shoes. We see him from the side, hovering over the churning ocean and one bright yellow spotlight from the Fort piercing the night sky. The “rocky” cliff that houses this prison lives up to the word “rocky”, with the minimalism of Francavilla’s art adding to the realism and drama of the scene. Mystery at the CoCo Club! “Smoky” and “noir” are two pulpy words that come to mind when the Black Beetle enters the CoCo Club. 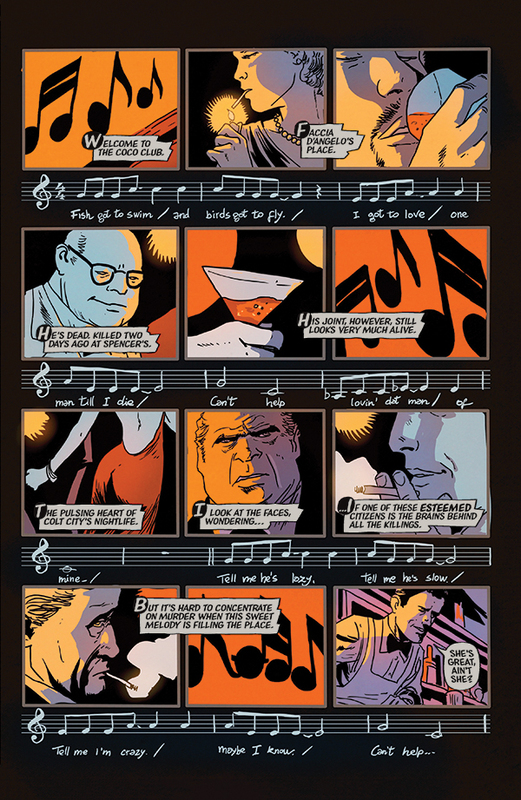 The first page of the third issue has twelve panels, with a variety of patrons (some looking innocent, others shady) and even musical notes contained in panels. Between these panels are musical bars and the words to the song “Can’t Help Lovin’ Dat Man” from the musical Show Boat. Turn the page, and there, in all its glory, is a two page splash reveal of the sultry blues singer singing in the smoke-filled club. Orange spotlights highlight the singing woman on stage and shadows abound, adding yet more atmosphere to book packed with it. Special mention must be made of various story and art touches that add to the overall artistry, fun, and loving homage that is contained in Francavilla’s creation. In the 1930s and 40s, readers of pulp fiction and listeners of radio serials would be in awe of amazing gadgetry used by their heroes. This story is no exception. The two foreign words “kara böcek” are uttered at one point by our hero, with the reader begging the Black Beetle to explain what he means by this word. This reviewer won’t lift the veil on that mystery. Different gizmos are used by our hero, such as a respirator that he uses to help him swim underwater, a helipack that aids in flight (which are used by Hitler’s Nazi Werwolf Korps), and a “portable submarine rotor”. On the gorgeous first page of the first issue of “No Way Out”, the Black Beetle utilizes a listening device while crouched on a rooftop in order to hear what’s going on in the adjacent building. This mystery man uses devices to aid his crimefighting, not as a crutch. Like other crime fighter everyone knows well, he also has brains and brawn in spades. Francavilla mentions in the extras section that people have always considered his art “cinematic” and embraces that by saying he lays out “the pages and the action” as if he’s “directing a movie”. There are even lobby cards in the back of the book. The cinematic qualities that make this book a masterpiece include the extreme close-ups, “cinematography”, heightened emotion and action, and mystery. These elements give the reader a sense that Francavilla is world-building and knows these characters inside out. Detail in the art and the mysteries that abound make for a thrilling tale that make one crave more details about the Black Beetle and his world. Like those old serials and pulp novels, we must wait for the next installment of the adventure in order gain answers and satisfaction. Stay tuned! There’s more to come and if it’s as exciting as this intimate and “cinematic” tale, then we’re in for more wild adventures and intriguing mysteries begging to be uncovered!